Have you ever wondered whether your attitude is contributing to your stress and anxiety levels? Or have you considered that some of your feelings and thoughts may be unhelpful in your management of stressful situations? If so, cognitive behavioural therapy (or CBT for short) might be perfect for you! As we reach the height of exam season anxiety, we’re talking all about CBT, an effective form of talking therapy aimed at changing patients’ thinking and behaviour, for better mental health and coping in the long term. If you’re struggling to manage your stress and anxiety levels, it might be time to consider speaking to a medical professional, such as one of our private GPs. So, My Doctor Has Recommended CBT. What Is It? CBT is a talking therapy, which can be useful in managing a range of emotional and physical problems by changing the way we think and react to the current problems we face. CBT aims to consider current problems, rather than issues from the past. CBT is based on the idea that your thoughts, feelings and actions are all connected, and that changing your thoughts can help to reduce negative feelings and sensations. Breaking down larger issues and dealing with the smaller component parts is a large part of CBT. The therapist will then work with you to try and change your behaviour and thoughts around a certain situation. Negative thought patterns can start from a very early age and may not be visible to you as they are so ingrained. A therapist can therefore help you to identify them and start changing them. For example, if you were told off a lot as a child, you might have started to think that a lot of what you do deserves scolding and that you were useless or not good enough. Over time, these assumptions may have become an automatic part of your adult life, affecting how you feel in even the smallest of situations. If these negative interpretations go unchallenged, they may become involved in a vicious cycle of negative feelings. Once you have broken down an issue into component parts, such as the associated feelings, reactions and thoughts, a therapist will help you to analyse each of these. From there, you can consider if these parts are helpful for you, or if there is perhaps a better way you could deal with them. The therapist will help you to work out how you want to change unhelpful thoughts and behaviours. The aim of the therapy is not only to help you to improve your current problems, but to be able to apply CBT skills to your day to day life. The same situation can lead to very different thoughts, feelings, physical symptoms and actions. CBT aims to help you change unhelpful parts into helpful ones – so that how you think affects how you feel and what you do in a positive manner. CBT aims to help you break out of a cycle of negative feelings that make you feel worse. When you can recognise unhelpful parts of the circle, you can change them and change how you feel. CBT aims to get you to a point where you can do this in your everyday life, without the need for help from a therapist. What Is CBT Used For? CBT has been recommended by NICE for the treatment of both anxiety disorders and depression, and is a suitable alternative or addition to anti-depressants. Cognitive behavioural therapy truly is a treatment that covers a wide range of conditions! What Are CBT Sessions Like? CBT can be given one to one with a therapist or as part of a group, and the number of sessions you should attend varies depending on the help you need. Sessions can vary between 30 to 60 minutes but CBT is not a quick fix – often it will require a lot of work by you outside of the session to really challenge your thinking patterns and beliefs. Therapists won’t tell you what to do – they will help you decide what you want to do, and what you think you could do to help improve your situation. CBT techniques can then be used for a variety of situations outside of the sessions. CBT can also be delivered by computer packages or telephone consultations – this makes it much easier to access for those with busy lives. There are two computer programs currently in use by the NHS; ‘Fear Fighter’, for those with phobias or panic attacks, and ‘Beating the Blues’ for those with mild to moderate depression. The first few sessions will enable the therapist to check this treatment is right for you and help you to feel comfortable with CBT as a concept. The therapist will help you to decide what you want to deal with and what you want to improve in the short and long term. Your therapist may ask you to keep a diary, noting down your thoughts, feelings and behaviours in response to certain situations: this will help you work out if those reactions were unrealistic or unhelpful, and how they affect you. Over time you should be able to question self-critical or negative thoughts and replace them with more helpful, positive thoughts. Your therapist will not ask you to do things you don’t want to do – you decide the pace of your treatment and what you want to try. Did you know that CBT can be delivered via computer packages or telephone consultations, making it much easier to access? What Are The Advantages And Disadvantages Of CBT? It focuses on you as a person and your beliefs; it will not tackle larger outside issues within the workplace or within families. If you are feeling low, if can be hard to concentrate and get motivated to change your thinking patterns. 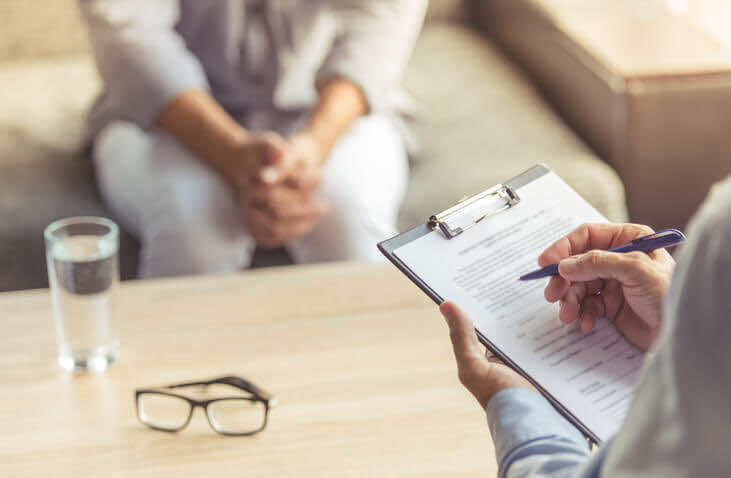 If you think CBT is for you, don’t hesitate to book a GP consultation to discuss your interest in this therapy – your GP can help arrange your enrolment on a CBT course convenient for you. In the context of student exam stress, CBT is not a quick fix to manage stress in the short-term. However, if you often find yourself in a vicious cycle of exam anxiety, it might be worth investing some time into CBT sessions to help you recognise and analyse your unhelpful behaviours, to better manage future stresses. Why not speak to one of our private doctors at London Doctors Clinic about your mental health concerns. Our doctors can advise on which therapies might be most appropriate for you. Simply book a future or same day doctor appointment at any of our 12 London clinics.